This is a journal of a long holiday I took in October and November of 2001, using up some of my frequent flyer miles and accumulated holiday. Even though I only stopped in a few places, I can claim to have been around the world. This was also my first trip to the southern hemisphere. Saturday, 13th October 2001. Seattle-Hawaii. The initial shock of the attacks on New York and Washington in September had not worn off, and neither had the effects (they still have not, a year later as I write this). There was a hint of gallows humour in the check-in queue, and resignation for the long wait. I was one of the last on the plane to Hawaii, even with a two hour check-in. I arrived in Honolulu, totally unprepared (this holiday was also a deliberate experiment to see how well I could get by without planning). I didn't even realise I would land on the wrong island until I read the in-flight magazine! 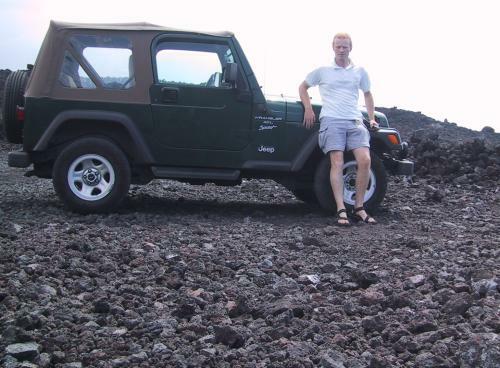 On landing, I simply walked over to a Hawaiian Air desk, took a flight to Kona, and rented a four wheel-drive Jeep. The rental agent told me not to call them if I got stuck on Mauna Kea summit road; they don't allow their vehicles up there, but she took the attitude that if I didn't tell, they wouldn't ask. I had intended to camp out, but since I was fairly late I bailed out after a quick look for a campsite and went to stay in a hostel. I found camping space isn't as easy to find on Hawaii as I expected. Went downtown, accidentally wandered through King Hamehaka's compound. At a local brew-pub, I met a Frenchman named Serge who had left Europe in 1969, after the student uprisings in Paris, who hadn't quite got around to returning yet. On a balmy tropical night, it's fairly easy to see why. Throughout the trip, the tropical vegetation that I saw was a constant source of wonder, and I also found myself surprised by how fast the dawn and dusk happened. 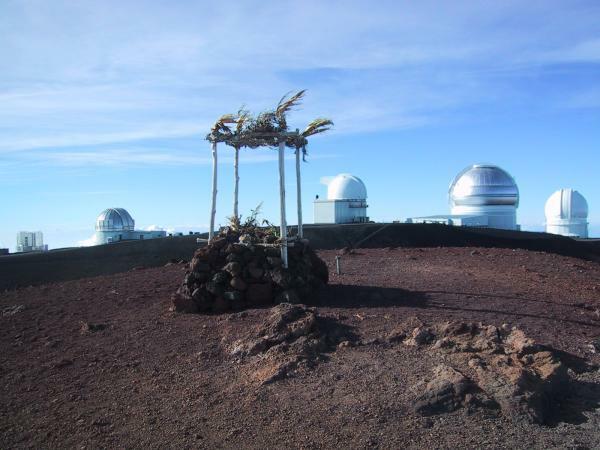 The weather was sunny and warm in morning, becoming muggy when `vog' (volcano fog) came off Mauna Loa. The top of the mountain was not visible due to the gradual ascent of the shield volcano's slope. 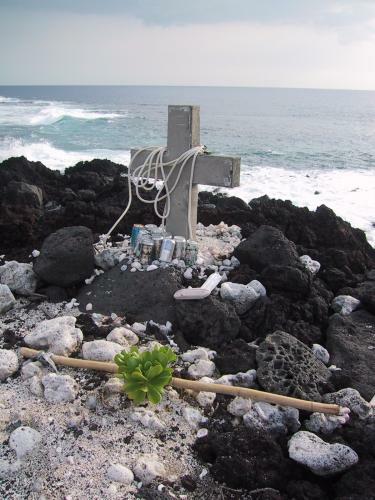 I left the tourist resort hell of Kona and headed south, stopping first where Captain Cook was killed. I found I couldn't walk to the Cook monument because I had taken the wrong road to bay (later, I found it impossible to find the right road; I think the monument may only be accessible from the water). Carrying on further south, I stopped at a rather bizarre painted church and at the Wakefield Gardens to look at tropical plants. The gardens were rather unkempt, but had some wonderful plants and cobwebs. Further south from Kona, I took a four-wheel drive track down to Manuka bay over a moonscape of broken pumice and lava, with almost no life visible. The beach was wonderful; coral and pumice make up a black and white stony beach. Old lava tubes cut blowholes into the shore, and the water was so clear I could see fish deep in them. The water in the rock pools was so clear I accidentally trod in them. Little black crabs scurried about. The shore had some strange human detritus, making for some bizarre speculation about what might have happened there; I found a sunhat, some cartridge cases, and a pair of underpants. A small cross was surrounded by unopened cans of beer, left like offerings. I watched a spectacular sunset, but was a little disappointed that it was too cloudy to see the stars. This night was the first test of a new Gore-Tex bivvy bag I had bought in Seattle before leaving. There was rain during night, clearing later to let the stars show. In the morning I continued south, driving to the southernmost point of the USA (unimaginitively called Southern Point). Southern Point is set in pastoral country, changing to windswept pasture at the point itself. It was surprisingly reminiscent of the west of Scotland, except for palm trees, occasional lava flows, and the fact that it was about forty degrees warmer. There was some fun four-wheel driving around the point. There were boats moored underneath the cliffs, with pulley hoists for people and gear to get down to them. I had made arrangements with the student of a friend to get a quick visit to the UK Infra-Red Telescope on Mauna Kea, so I drove fairly quickly around the Kilauea crater rim drive, stopping at the tourist spots. The scenery was amazing, prompting a longer visit later in the trip; the scale of the caldera collapse and re-fill was very impressive. Driving on to Mauna Kea, I acclimated for 1 hour at the tourist stop and then drove on to the observatories, at 4,194m (13,759 feet). I walked to the top and sat watching the sun set, at that moment being the highest person the Pacific. After a quick tour of the UKIRT I started to feel the onset of altitude sickness (a little bit of nausea), so I excused myself and drove back to Hale Pohaku at 9,000 feet and spent some time stargazing with the volunteers there, arguing about UFOs and tachyons with one of them. Finally tired, I headed down mountain to rain forest, and took a sidetrack to find somewhere to sleep. I woke up in the car in a rain forest, and descended into more rain in Hilo. I drove through the rain to Volcano, stopped at the Lava Rock Internet Cafe for breakfast. After a very nice breakfast, I wrote postcards while waited for the rain to ease. 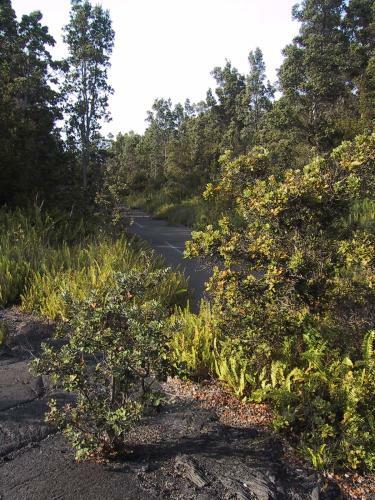 Returned to the volcano national park, I walked the around Kilauea Ika trail through a 1950's volcanic crater. 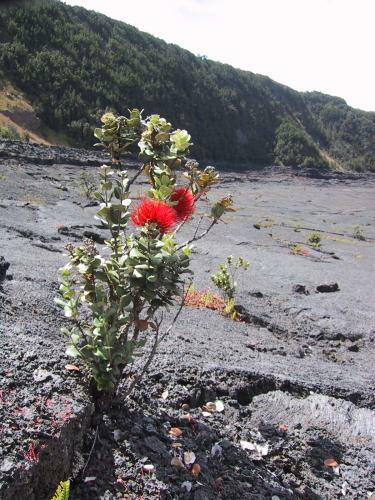 The devastation was amazing, but the plants pushing though the lava provided food for though about how tenacious life can be. 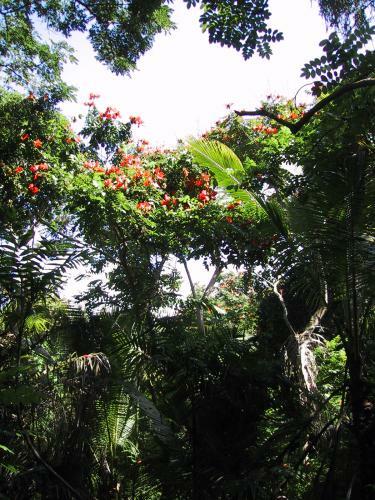 Climbing through rain forest, I arrived at the Thurston lava tube. I went back with to the car to fetch a head-torch, to explore the undeveloped section; 334m of beautiful cave, unspoiled as yet by tourists. I drove down the chain of craters road to end, and walked a little towards where the lava enters the sea (the ``West Steam''). I thought about returning the next day, but for this night I had a permit to camp in the Nahua campsite, close to the Kilauea crater. I hiked the Nahua trail to crater, through lava fields (aa-aa and pahoehoe) and through rain forest. The trail sometimes came across bizarre sections of old road emerging from the lava; it felt very like a lost world from an H. Rider Haggard novel. I bivvied at Nahua campsite, having the entire campsite to myself. I didn't sleep well, even though the bivvy was comfortable. I had made a head shelter from my pack and poles. The night was damp but not dark. The insects around made a terrible noise, solved with the use of earplugs. I woke after first light and hiked out at a leisurely pace. Driving back to Cook, I wasted some more time searching for the track to the Cook memorial. 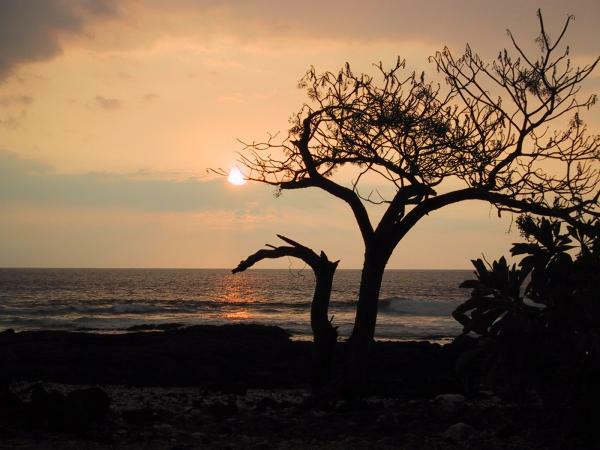 Eventually I gave up and looked for place to swim and wash, eventually settling on a bit of coast with some rock pools by Kona airport. I had intended on going big game fishing the next day, but I had left it rather late to book, so I set up a checkout and rental of a light aircraft to go sightseeing in for Thursday. I headed north looking for somewhere to camp, stopping in Hawi for dinner. A very busy day. I slept in the car off the Mauna Kea/Loa saddle road, having failed to find anywhere nice to camp at night. I attempted a couple of four-wheel drive only detours on the way back to Kona, but they didn't lead anywhere interesting. After a coffee (Kona, of course) I went swimming and body-surfing at small but fairly busy beach, seeing turtles and chased fish (I didn't catch any, they swim better than I do!). I tried to get lunch in a bookshop cafe, but the fire-alarm went off and put paid to that. I had brought my pilot's license with me, and in the afternoon I checked-out a Cessna 172 from IslandHoppers in Kona, and took it round to view the lava flows from Kilauea. The visibility was poor, and the wind was fairly strong. I made it to the ``West Steam'' in time to view lava pouring into sea, it was much more impressive in person than my photographs. I did misjudge the wind a bit, but arrived back just as the sun went down. I checked in and got an earlier flight back to Honolulu, allowing for a leisurely dinner before flying on to New Zealand. Friday, 19th October 2001. Hawaii-New Zealand. The ``missing'' day. I slept right through it, because of the dateline crossing. Saturday, 20th October 2001. Hawaii-New Zealand. I woke up to discover I'd slept through Friday! Arriving in New Zealand, I was searched by biosecurity because I had been camping. I was met by my uncle Mike, and he drove us to their home in Whangaparuoua. The afternoon was spent in Auckland gathering brochures, maps, and last-minute supplies. The evening was spent fixing computer problems, and arguing about politics. Sunday was spent relaxing, reading brochures, searching the Internet for hostels and information, making plans, and fixing computer problems. 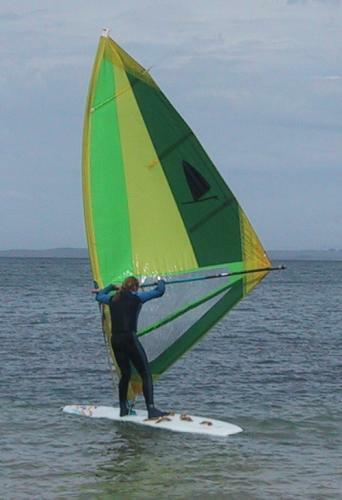 I went windsurfing on my cousin Caroline's windsurfer in the afternoon. 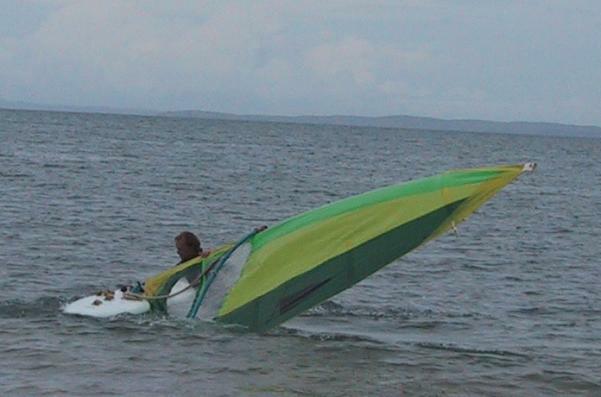 I was OK going in a straight line, but crap at tacking. I tried to connect to my web-site back in the USA, but got shut out (it later turned out to be a SCSI disk problem, which has caused me no end of trouble). I finalised my plans for New Zealand; since this was a public holiday, it wasn't worth trying to travel. My cousins Belinda and Maria came for lunch, the first time I have seen them in years. We went to Shakespear [sic] park and flew my kites until the lines broke, then checked out the commuter ferry times for the morning. I have planned an itinerary starting in Christchurch, via Arthur's Pass to Abel Tasman park, then across to Wellington, up to Lake Taupo, surfing in Raglan and back to Auckland. Rain started to fall in the early afternoon; not thundery showers as forecast, but solid continuous rain, continuing for hours. I hope it stops before tomorrow. I went to Gulf Bay first thing in the morning, only to find that the ferry wasn't running. Uncle Mike drove me to airport, where I got a standby to Christchurch (which was much more expensive than I expected). The first flight was full because of a broken Monarch airlines plane, but I got on the 11:20, in a business class seat. After waiting ages for my luggage, I found it had made an earlier flight and was already off the carousel. Once in Christchurch, I went to the Department of Conservation and then to Trailblazers, and booked travel around New Zealand. I stayed at the Vagabond backpackers; the staff were very friendly, something I found repeated throughout my stay in New Zealand. I got food for the next few days, did some laundry, and then headed out for dinner and beer at the Loaded Hog brewpub. Christchurch is a fairly relaxed place, it could do with more time to investigate thoroughly. 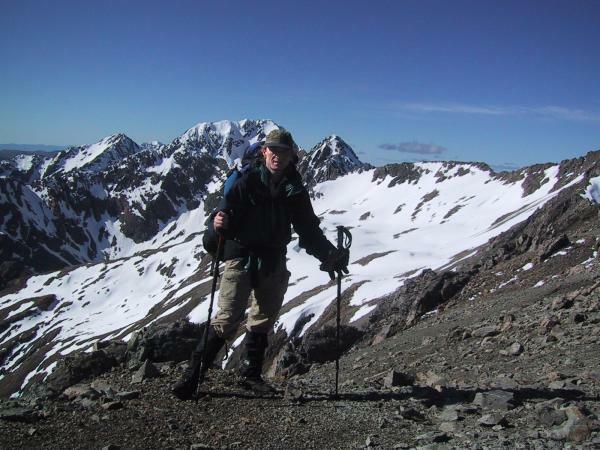 My first day tramping in the mountains. The train ticket as booked didn't allow stopover, so I altered it for $11 NZ, cursing the Auckland visitor centre. I was stuck with some chatty Americans in the train, who didn't seem that interested in the stunning scenery passing by outside. 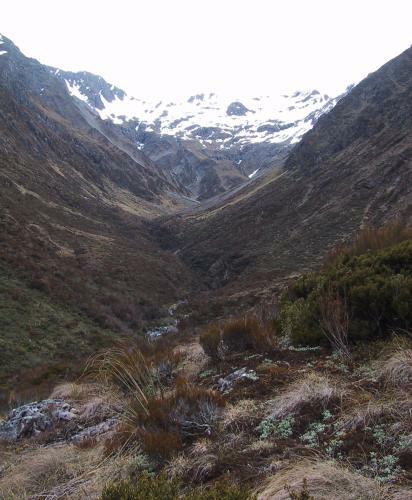 I got off at Arthur's Pass station, and went to the Department of Conservation office. I spent half an hour deciding where to go (deciding on a an ``unmaintained trail'' over some peaks to a saddle, and down the Minha river). It didn't quite work out that way; I took 5.5 hours getting to summit of curiously-named Blimit because of rotten scree slopes, and decided not to cross the saddle that day, baling out because of the late afternoon avalanche hazard and time; it wouldn't be possible to descend the other side before dark. I stopped at the Page shelter by an out of use ski tow, trudging across some fairly dangerous slopes to get there. It was a clear night, looking good for star gazing. This was a very hard day of walking. I did nine hours of climbing and walking, the first 5 kilometres taking over four hours, then 14 kilometres more in 5 hours. I had got up late after listening to the wind howling around my shelter; there were stars out, but it was too cold to stay out and look at night. I decided to climb to Temple Col and have a look at the route even though it was fairly late. 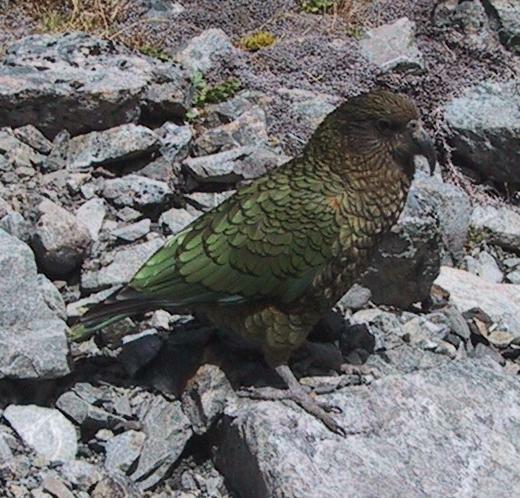 The climb over scree and snow slope was faster than I expected, so I scoped out the descent while a Kea (alpine parrot) hung around hoping for scraps at the col. I descended well-consolidated snow slopes to a grassy ridge, and then to the stream bed quicker than I had expected too. I lost all the time gained with 2.5 hours of hard bushwhacking through impenetrable scrub to join the Goat Pass trail. I plodded downstream, crossing rivers and stopping every couple of hours for food and water. I made it all the way to the Bealey river with dry feet, before putting my Tevas on to cross the river. The cool water was very nice on my tired feet; I wanted to cross the river that night in case it rained during the night. The river is prone to flash-flooding, and I didn't want to be stuck on the wrong side of the river in the morning. 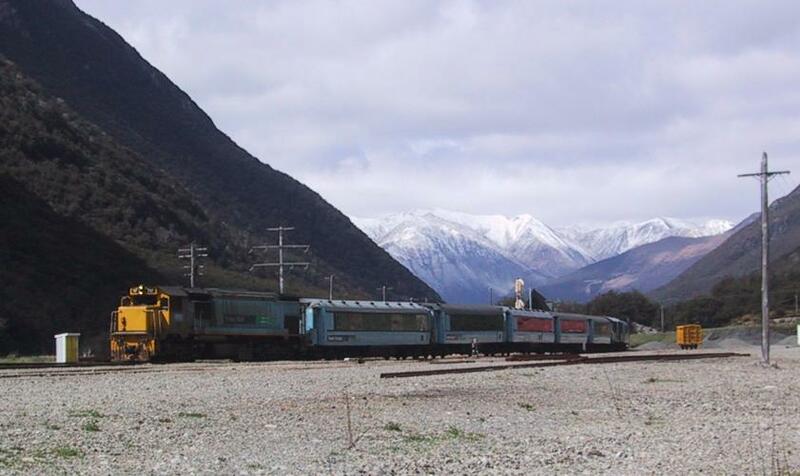 The TranzAlpine train went by as I crossed, giving someone a good photo opportunity. I found a rather uncomfortable site and bivvied the night, occasionally waking for trains passing. During the night the clouds parted to reveal the southern sky, but it was hard to recognise anything, even with a star chart. I think I saw the Southern Cross, but couldn't be sure I had identified it correctly. I got up after a poor night's sleep when sandflies started attacking. After a quick breakfast I walked into Arthur's Pass. I signed out at the Department of Conservation with a couple of ascerbic comments about bushwhacking (the ``unmaintained'' trail was non-existant), and then made phone calls to arrange a hostel in Nelson and a bus pick-up to get to Nelson and for the Abel Tasman trail. The long bus journey from the train station at Greymouth to Nelson was punctuated by comments from the chatty driver, providing some fairly interesting insights into the spectacular rain-forest country that we were driving through. Walked to pancake rocks at P??????. The bus diverted for an accident before Murchison, and so was late into Nelson. Ali and Jeff at Shortbread Cottage in Nelson were very welcoming and very hospitable nevertheless. Yet another early start. My right eye had swollen up; it was bitten by a sand-fly or something on Thursday or Friday, and the swelling around the socket was quite bad. My towel and some socks were still damp, since I couldn't use the dryer the previous night. At least I got myself clean. 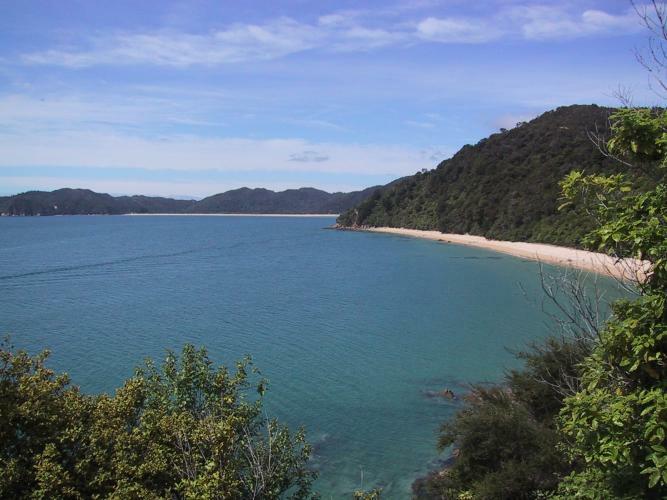 Yet another chatty bus driver (actually two, since there was a change of busses) took me to join the Abel Tasman trail at Totaranui instead of Wainui Bay; I decided that I wasn't fit enough to do more than 20 kilometres a day, and would prefer to enjoy the walk. Enjoy it I did, with my shirt off in warm sunshine for most of the way. I took one accidental detour before Awaroa bay, clambering round the headland instead of taking the track over it. I was still in plenty of time for the tidal crossing at Awaroa. On passing the lodge/caf� I saw no one until Onetahuti beach, where the water taxis were picking up and setting down. A short walk on from there brought me to Tonga Quarry, my campsite for the night. I initially thought I had it to myself, but a girl had beaten me to it, taking the best spot. The weather forecast is for heavy rain tomorrow; not promising. They were right about the rain . Drizzle started in the evening, followed by heavy rain all night. I spent most of the night tossing about, trying to get a position where water didn't come in through the face hole of my bivvy bag. 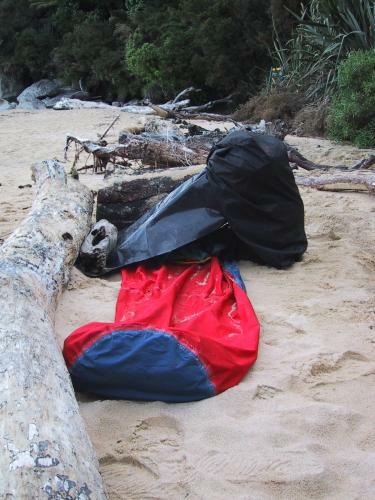 This appears to be the bivvy bag's main weakness, apart from that it was quite waterproof. I still ended up with a puddle under my head. A tree-fern shed a branch close by just as the rain started, giving me further cause for concern. I got up as soon as enough light to try dressing in the bag; after some hopeless contortions, gave up and unzipped the bag. I threw my waterproofs on and walked to Bark Bay via the high-tide route in pouring rain, arriving at 8am. Took advantage of the facilities there to (mostly) dry my sleeping bag and bivvy bag, and have breakfast. I left just before 11am, after introducing a nice English girl to the restorative effects of chocolate-covered coffee beans. The rain had stopped, so I made good time to Torrent Bay, another tidal crossing. The path along the way wound through lush forest, with a wonderful wire suspension bridge (which I should have photographed) crossing one of the streams. I phoned around at Torrent Bay to set up accommodation for Wellington and Turangi. I arrived at the Anchorage hut in time for more rain and lunch, joining some unlucky kayakers, drying-out from the surf. The sun came out in the afternoon, so I spent it drying, sunning myself, and watching the progress of some ominous black clouds. In early evening, I snarfed a piece of discarded tarp from the new toilet construction site to make a face-shelter, and headed for Watering Cove. My tarp contrivance worked well, though I didn't need it; the night was beautiful. I stayed up to check high tide was OK, since I was bivvying on the beach. Mars rose, some stars as well, but there was too much cloud to recognise any constellations. The moonlight was amazing; I tried to take a photo of the beach by moonlight, but there wasn't enough light for the camera. The sun came out in the morning, so I had another drying session, watching the birds hunt for sand-flies. The walk out was nice, especially before the water-taxis dropped too many people off. The cake and hot chocolate at a cafe at Marahau were very nice too. The conversation on the bus journey was bizarra; about 5 bus drivers were aboard, discussing the merits of different buses. ``Phoar! That number 19! Pulls like a horse!''. I returned to Shortbread Cottage for the night, and spent a night out in Nelson before the Picton bus in the morning. I finally got my laundry done, albeit at a rather steep price. I stopped for dinner and a pint at a faux Victorian pub, until I was crowded out by a party of unfortunately stereotypical Germans who came in, re-arranged the table I was sitting at without asking, started smoking in a non-smoking area, and expected service in a self-service section. I retired to the cottage, where I had a dorm to myself. After a good night's sleep (my first in New Zealand?) I had a lazy breakfast and headed outside to wait for the bus. Ali had phoned to arrange a pick-up, but by 20 minutes past time, myself and Karin (a girl from Sweden who was also taking the ferry north) were concerned. It turned out the scheduling computer was down, so they sent a minibus to get us from Nelson to the Picton bus, which had already left. The rain poured down as we left. I decided to change my plans and stop an extra day in Wellington, to visit the botanical gardens and Te Papa, the national museum. I also thought about looking for surfing in a more accessible location than Raglan. The interisland ferry ride was scenic and efficient; a mild swell in the Cook Straight made it very pleasurable. In Wellington, I went to Wide World backpackers; it was slightly run down, and the free wine and breakfast were rather meagre. I took a quick wander around town, before finding a Malaysian cafe/restaurant for dinner. Again, it was adequate rather than great. 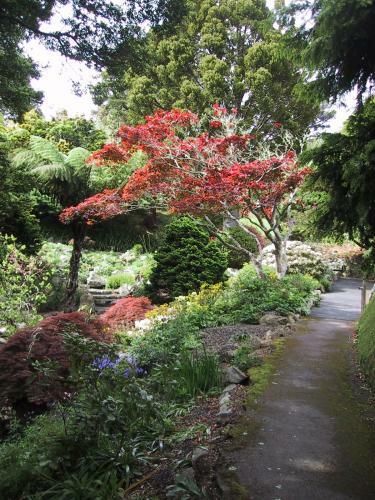 In the morning I took the cable car up to the Wellington botanic gardens; I got a return for the cable car, not realising the gardens covered the whole hillside, and the walk through gardens would bring me out in the city. It was a very pleasant and peaceful walk through the gardens. It also took longer than I expected, so I stopped briefly at the Department of Conservation for information about the Tongariro crossing (one of the classic hikes on the North Island) before looking for a quiet, cheap cafe for lunch (a quest I gave up on eventually and found a brewpub instead). I headed for the national museum of New Zealand, Te Papa, in the afternoon; I'm glad I did it that way round because the weather turned very windy and wet. The forecast for the week was poor; much more of the same. The Tongariro crossing didn't look likely due to high winds, poor visibility, and low freezing levels. The surfing looked poor too, so I made alternate plans for fishing, hot springs, and a trip to the Northland. 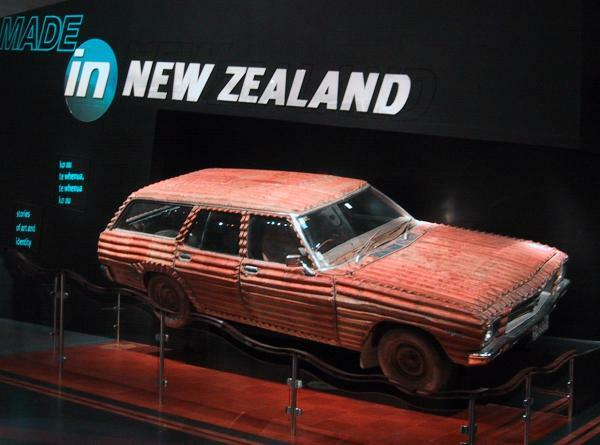 Te Papa was very good; at least another day visiting it would be worthwhile (they included showed some of the local automotive products). I bought a couple of books at a second-hand bookshop to read while weather was foul. Rain, rain and wind on way to Turangi. I read Sue Townsend's ``The Queen and I'' on the bus. I arranged a fishing guide with visitor information (this was a bad idea; contact the guide directly and avoid the information's cut for doing nothing). Arriving at Bellbird Lodge I found nobody waiting but a cat and a dog. After waiting a while, the owner, Clive turned up and so did Cindy, the Korean girl who was tending the Lodge, and the guy who was to replace her that week. It turned out I could have borrowed fishing gear from Clive and saved myself some money. Rain bucketed down at night, so I stayed in and helped Cindy with her English grammar. The weather was definitely not suitable for the Tongariro Crossing (high wind and low cloud). Frank Harcourt, the fishing guide, turned up in the morning. Frank is a gruff Lancashireman, married to Carol, a Kiwi. We went and looked at some rivers, but the overnight rain had clouded them up badly. After a quick stop for coffee, during which I fixed some problems with their web-site, Frank dropped me off and I went for a walk down the Tongariro river, getting soaked by the rain. In the afternoon I took all of 5 minutes to see everything Turangi had to offer. It would be generous to even call it a one-horse town. In the evening, Frank and Carol showed their hospitality by taking me to the RSA club (returned servicemen's association), where we played a few games of bad snooker and drank beer from the cheap bar. We finished off the day with a meal at the local chinese restaurant. More rain. Having not rained all night, the rain started about 7am and went on for most of the day. 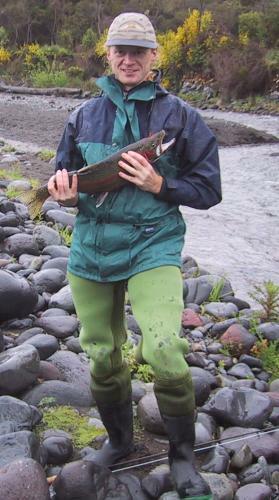 The Tongariro had cleared a lot, so we went fishing anyway. Within a few minutes of starting I hooked up a small male rainbow trout; I thought it might be a good day, but it turned out to be foul-hooked. The rest of the day was spent getting wet and depressed trying to catch tourist board fish (the sort you can see, but won't take anything, no matter how it's presented). I had a couple of takes that I failed to set the hook in properly, and a few follows, but the fish were wary and easy to spook. I decided to move on in the evening rather than have to wait until the afternoon, so I took the early evening bus to Rotorua. I slept most of the way on the bus, waking up to the bizarre juxtaposition of rolling green hills with steam escaping from them. This day was spent doing typical tourist stuff, because the weather forecast wasn't good. Arranged to go to a Hangi in the evening, then took shuttle bus to Whakarewarewa. I felt cheated when I found how close it was; I would have walked if I'd known. 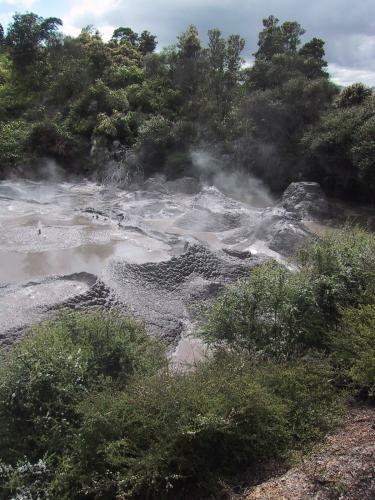 The geysers and mud pools were interesting, as was the people-watching. Busloads of Japanese tourists would turn up, take photos of each other standing in front of hot pools, and walk away without ever looking at or thinking about the sight they were in front of. I spent the afternoon in the thermal hot tub while my clothes went through the washer and dryer. In the evening, I went to the Tamaki family Hangi. It was a good show, if you like that sort of thing. I managed to get myself elected chief of my waka (literally, a canoe, but in modern parlance any form of transport; in this case a bus). This gave me some ceremonial duties; accepting the challenge and the greeting on behalf of my iwi (tribe, or bus passengers in this case). The cultural show included war dances (haka), demonstrations of traditional musical instruments and weapons, and sung recitations of legends. The feast was plentiful, and included lamb, chicken, smoked fish, mussels, sweet potatoes, potatoes, and carrots. I suspect the dessert of ginger steamed pudding and custard was not cooked the traditional way, in a closed earth pit above heated stones. The bus driver/guide was informative and entertaining throughout the evening, topping it all by getting each nationality on the bus to sing a song on the way back (the only thing I could remember was Flower of Scotland, so I treated the bus to a bad rendition in a key that turned out to be too high for me). The weather broke; it was warm and sunny all day! I hired a mountain bike and spent six hours riding every trail in the Fletcher Challenge forest. This is a managed forest just outside Rotorua, with some of the best single track I've ridden anywhere. I returned tired and covered in mud, but fortunately no blood, even though I nearly ended-over a couple of times. A quick splash in a freezing shower to wash the mud off, and then I spent some time relaxing in the hot tub. I don't understand how the hot water for showers can run out, when they have a geothermal hot tub. I embarked on a fruitless search for a local cafe to sit and read in, but they all closed at 5pm, so I ended up in Starbucks. No wonder the locals can't compete, if they serve their customers like that. The first official snafu of the trip. I phoned Air New Zealand and found my plane on Wednesday was cancelled (actually a schedule change shortly after I left Seattle). I got it re-booked for Thursday, and got them to agree to compensation for a shuttle to the airport. 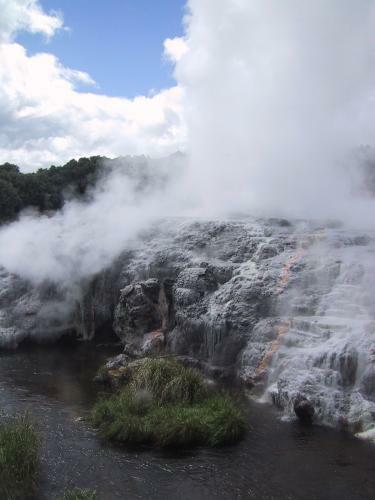 I decided to head for Auckland in the evening anyway, and make the best of the day in Rotorua. I had booked a tandem kayak trip on the Kaituna river, so I tacked on a whitewater kayak lesson. The tandem trip was short, but a lot of fun. After a few practice rolls, the guide, Alan, and I followed a rafting party and l couple of trainee raft guides down the river. A gaggle of single kayaks went down with us, including a friend of Alan's who came 7th in the world Rodeo kayak championships. The section of the river we kayaked was short, running through a gorge and culminating in a drop off a 7m high waterfall. We made it down the river without rolling, not bad considering the flow was higher than Alan had ever kayaked the river. The lesson was another matter; I practiced my whitewater swimming a couple of times, as we repeated the top section of rapids several times. I got some assisted rolling practice, but not a self-controlled roll. A short stop in a cafe/bar for a beer and the largest chocolate-chip cookie I've ever eaten, and a chat with a friendly Rotorua guy and a female English doctor who was working and travelling in New Zealand, and I was on the bus for Auckland. After a sleep in (I hadn't realised how tired I was), I spent much of the day faffing, helping my uncle Michael with his web-site. The weather was miserable in the morning anyway, pouring with rain. In the afternoon we took a quick trip into Auckland to go to Kelly Tarlton's underwater world (nice fish tanks, but quite a steep entrance price). We also went up the Sky Tower, a somewhat pointless communication tower with revolving restaurant. Parts of the tower were closed while they constructed a bungy jump (it wasn't yet open, awww...). 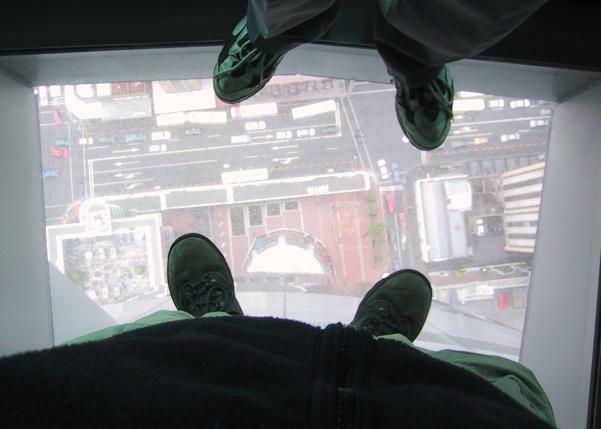 I took a couple of photos through the glass floor of the observation deck before we headed back down. Thursday, 8th November 2001. New Zealand-Hong Kong. I left for the airport early; check-in and security was a breeze, so I had plenty of time in the departure lounge to spend my remaining New Zealand money. The flight was delayed because of a faulty APU on the plane, and then re-routed because of a cyclone over the Phillipines. It was a good, but long flight anyway; I had a spacious bulkhead seat with legroom and a view of the movies (Planet of the Apes, Tomb Raider). I got views of New Guinea before the thunderheads got too big. 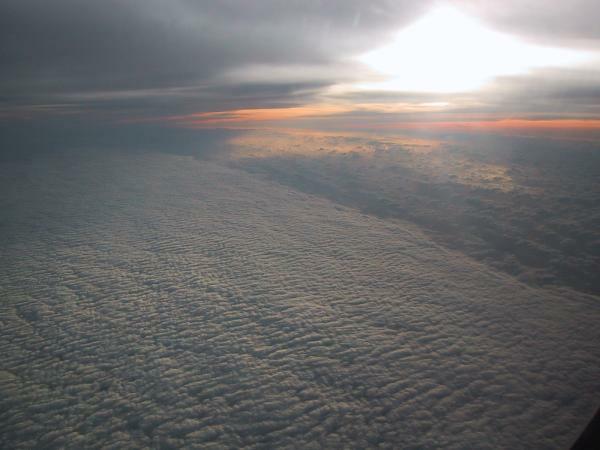 I also saw a glimpse of the Phillipines, and a beautiful sunset over clouds in the South China Sea. Hong Kong is a scary vision of the future; not just one or two high-rises, but hundreds, spread out over miles and many islands. The airport train has seat-back TVs, showing route info, transfers, adverts, news and current events. Customs and baggage were efficient, I was through quickly and easily found an ATM for cash and bought a three-day tourist pass for the metro. I discovered this pass was a smartcard when I had to wave it in front of the exit gate of the airport train to escape. My first day in Hong Kong. I was too tired last night to go out. The hotel (YMCA Salisbury) appears to be quite nice, and the room has a little bit of a view of Kowloon waterfront (thanks to my well-travelled friend Rosy for the recommendation). Smart cards abound; not only are the room keys electronic, they are also required to turn on the electricity in the room. Making myself understood may be a problem; I stopped at a little cafe for breakfast, thought I was ordering noodles with vegetables, but got noodles with ham and egg! In the afternoon I took the Star Ferry to Hong Kong Island and spent many hours wandering through warrens of streets with market stalls, clean bright malls, etc. The contrast between shops is amazing; a florist could be next to a plastics distributor, a metalworker, a designer clothes or jewellry outlet, or one of the thousands of little restaurants or take-aways. About the only thing that seems hard to buy is the one thing I was after-postcards! Lots of construction was going on (that's not surprising), most of it with bamboo scaffolding (that did surprise me, especially the height of it). 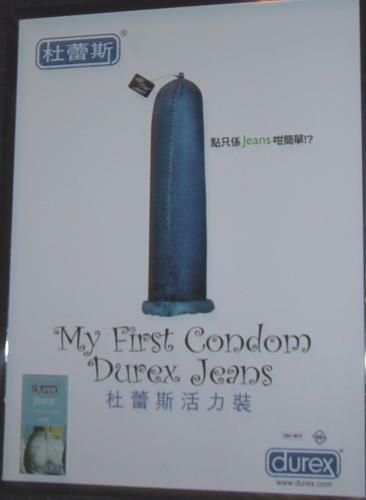 I had to laugh at the ``My first condom'' advert in MTR stations; I have no idea what it's about (it looks like a jeans advert), but it is pretty surreal. I realised in the rush hour train back to the hotel that I am slightly above average height for Hong Kong, rather than below as elsewhere. Other demographic observations were the total lack of other red-haired people, universal cell-phone use, lots of smoking (especially in restaurants) and almost no overweight people. In the evening, I went to a bad modern dance production supposedly based on the movements of martial arts. There were a few redeeming sections, one a ballet-trained dancer representing the cultural revolution, an archer's dance, and a genuine Wing Chun master (mistress? - she was female) performing a dance form. Went to see the real thing; early morning Tai-Chi in Kowloon park. There is, of course, no way of knowing how expert the practitioners are but by watching. This is as it should be, watching reveals the strength and confidence of the people. There is something slightly strange about watching an ordinary old housewife pull a sword out of a bag and start laying about herself in public. I took an indirect route up to the Peak, via Man Mo Temple, the Zoo/Botanical Gardens, Virgin Atlantic offices and the Peak Tram (actually a cable car). It was slightly hazy, so the views weren't worth photographing, but they were worth seeing. The amount of shipping in the port was remarkable; most of the cities I know face post-industrial decline, and do not have the signs of industrial activity. I had brunch at one of the fancy peak restaurants, and then a couple of hours walking in Victoria Peak park, up to the true peak and viewpoints. Saw some beautiful butterflies. I walked down the Old Peak Road, and then back to the Salisbury for a swim in the pool. I saw the Hong Kong sixes tournament on the television; it was at the Kowloon Cricket Club, so I decided to try to get a ticket for the next day. In the evening I went to the street market to try to get presents. I wasn't in the mood for it; tired and hungry, I came back to the hotel and went to the International buffet dinner. I overdosed on fish (thinking I'd probably pay for it later), since they had clams, prawns, steamed eels, sushi, sashimi, etc. I don't understand the relationship between the YMCA and the Salisbury; I can't see the YMCA being to supportive of unlimited free beer with meals. 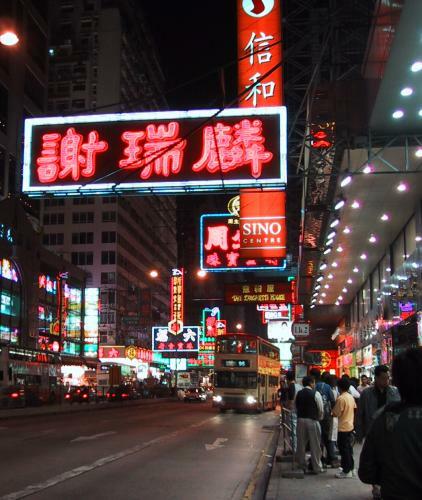 I retired half pissed and very full; I've not exactly been a live wire in Hong Kong. A fun day. I wandered up to the Kowloon Cricket Club in the morning, to find it was finals day at the Hong Kong Sixes. After a quick dash back to the hotel to check out and leave my rucksack in left luggage, I returned to the KCC for a hugely entertaining day. The boundaries were short, the matches only lasted 5 overs, extras counted more and the rules for wides and no-balls were harder (wides were 2 feet on-side, 1.5 feet off side, no bouncers or beamers were allowed, no-balls were live and so were wides). The boundaries were flying thick and fast, with many balls going outside the ground. It's the first time I've seen a cricket ball split in two. I found myself between the Indian and Sri Lankan supporters. Since they weren't playing each other, they cheered for each other, and both against Pakistan. There were some fantastic games, especially Australia vs. India, and the final of Pakistan vs. South Africa. Pakistan won; but only after South Africa had chased to within a few runs. The run rates were very high; some matches averaged more than 20 per over. The quality of the players was good too, with cricket stars and legends such as Wazim Akram, Jonty Rhodes, and Craig McDermott playing. After the game, I wandered through the street market again, finding a couple of belated birthday presents. Too soon it was time to pick up my luggage from the hotel, and head off for the airport. 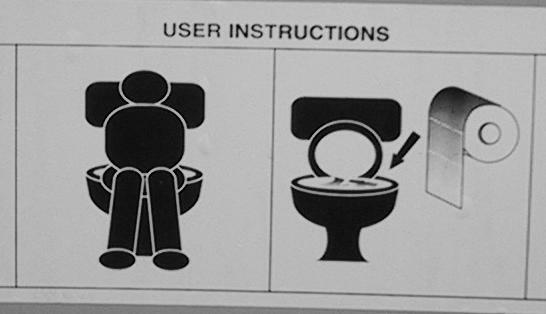 I leave with the thought; do they have to be so explicit on the toilet signs?. Monday, 12th November 2001. Hong Kong-London. I arrived in London early, and was picked up by a hire driver for the trip to my company accommodation in Cambridge. Friday, 16th November 2001. London-Seattle. After a (short) week easing back into work, renewing my aviation medical, and dealing with the hundreds of email messages piled up while I was away, I am back off to Seattle.